The 2018 Government survey of private landlords in England has now been finalised and a report was issued on 31 January 2019. The report makes interesting reading and we’ve picked out some of the most interesting facts. The survey indicates there were around 4.5mn private rented properties in England in 2018, which was a large increase on the 3.6mn properties held in 2017. While most landlords tend to rent out their properties privately, 4% operate their rentals via a limited company and 2% as an organisation. Throughout 2018 there were around 3.4mn deposits registered with a government-backed tenancy deposit protection scheme, equating to around 1.5mn landlord deposits. The researchers estimated that tenancy deposit protection schemes cover between 56% and 71% of all private rental households. Below is an infographic taken from the survey highlighting some key statistics. Most landlords (45%) only own one rental home even though there has been a hike in privately rented properties. This amounts to a 21% share of the total rentals in the sector. Around 38% of landlords own two to four properties, amounting to 31% of the rental sector. 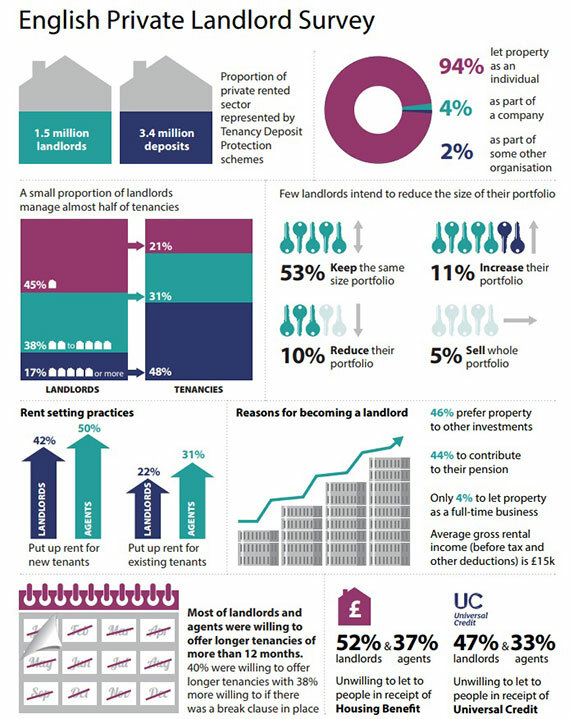 17% of landlords own at least five properties and represent 48% of the sector. Landlords owning just one property have been in decline since 2010, when 78% of private landlords were in this category. In contrast, landlords owning five or more properties have increased from 5% during this period. Most landlords have owned their rental properties for some time and tend to be older and less ethnically diverse than the UK population as a whole. Almost 60% of private landlords are over the age of 55 and one-third have already taken retirement. Around 89% of private landlords are white. Approximately 70% of all landlords have rented property for six years or more, with the average around 11.5 years. 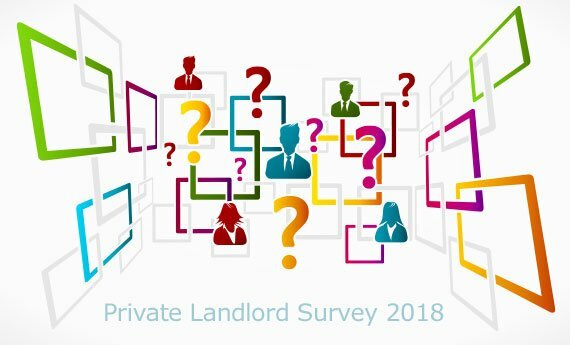 Most landlords deliberately entered the private rentals sector, although 32% of the survey respondents stated they actually purchased their first property with the intention of living in it themselves. What percentage of total income was generated from rental properties? When it comes to income from property rentals, the average tended to be around £15,000 per year and most Landlords said that rental income comprises approximately 42% of their total annual income. About 61% of landlords said they received gross property rental income of less than £20,000, whereas 26% stated their rental income was from £20,000 to £49,999. Around 13% of landlords stated their annual rental income was £50,000 or above. More than half the Landlords surveyed said they had no plans to purchase any more rental properties in the next 2 years. Secondly, 11% said they would be buying more properties. In addition around 10% of Landlords plan to cut the number of properties owned and this represents a total of 18% of all tenancies. And, around 5% stated they plan to sell all their rentals and leave the private sector altogether. 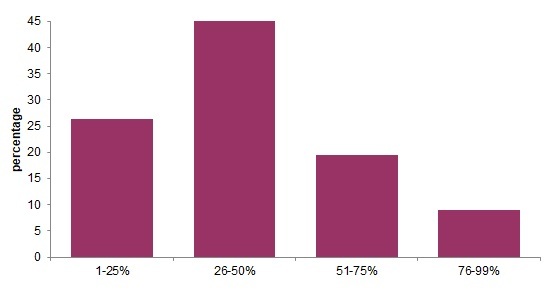 Percentage of Landlords planning to change portfolio size. When it comes to financing their property, around 49% of landlords who’d been in the business for three years or less had taken out buy-to-let mortgages to fund their purchase. This figure increased to 58% for landlords who had rented out property for four to ten years. 72% of Landlords financed their first rental property with a mortgage. 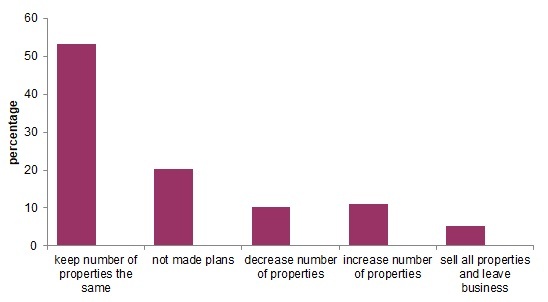 The graph below shows how other Landlords financed the purchase of their 1st rental properties. Virtually half the Landlords indicated that property was their preferred type of investment. Also, 44% had entered the sector to build pension levels. Surprisingly, only 4% ran their Landlord enterprise as a full-time business operation. Here’s a breakdown of the top reasons Landlords gave in the survey. To read the entire report, head to the UK government website (https://www.gov.uk/government/publications/english-private-landlord-survey-2018-main-report). The 2018 government of private landlord survey in England has now been finalised and a report was issued on 31 January 2019. The report makes interesting reading and we've picked out some of the most interesting facts. Interesting survey. What percentage of landlords act outside the laws and regulations and how many have been prosecuted? Why have you identified ethnicity of private landlords? Hi Sue, thanks for commenting. The survey doesn’t give details of landlords acting outside of laws and regulations nor prosecutions. I’m sure it would make an interesting topic for a future article though. The ethnicity statistic in the survey was included with other notable stats from the entire survey which we felt would be interesting for you and our other readers.